Reports say Prime Minister Narendra Modi and Home Minister Rajnath Singh told her that they could not "offer a dialogue with separatists and other restive groups in the valley" while fierce violence and militant attacks continued. Former chief minister and leader of the regional National Conference party Farooq Abdullah warned India that it was "losing Kashmir". What Mr Abdullah suggested was unexceptionable: the government should begin talking with the stakeholders - Pakistan, the separatists, mainstream parties, the minority Kashmiri Hindus - and start "thinking of not a military solution, but a political way". Image caption Political leaders say Kashmir needs a political and "not a military solution"
With more than 500,000 security forces in the region, India is unlikely to lose territory in Kashmir. But Shekhar Gupta, a leading columnist, says that while Kashmir is "territorially secure, we are fast losing it emotionally and psychologically". The abysmal 7% turnout in the Srinagar poll proved that "while your grip on the land is firm, you are losing its people". Ajaz, a 19-year-old student in Budgam, told me that hope had evaporated for his generation "in face of Indian oppression" and he and his friends did not "fear death". When I took him aside after a while to ask about his ambitions in life, he said he wanted to become a bureaucrat and serve Kashmir. 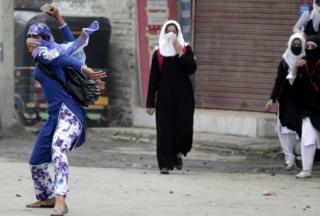 "It is wrong to say that the Kashmiri youth has become fearless. He just feels alienated, sidelined and humiliated. When he feels like that, fear takes a backseat, and he becomes reckless. This is irrational behaviour," National Conference leader Junaid Azim Mattoo told me. Wani, the militant who was killed last July, headed a prominent rebel group and came from a highly-educated upper-class Kashmiri family: his father is a government school teacher. Wani's younger brother, Khalid, who was killed by security forces in 2013, was a student of political science. The new commander of the rebel group, Zakir Rashid Bhat, studied engineering in the northern Indian city of Chandigarh. Fourthly, the government's message on Kashmir appears to be backfiring. When Mr Modi recently said the youth in Kashmir had to choose between terrorism and tourism, many Kashmiris accused him of trivialising their "protracted struggle". When BJP general secretary Ram Madhav told a newspaper that his government "would have choked" the valley people if it was against them, many locals said it was proof of the government's arrogance. Fifth, the shrill anti-Muslim rhetoric by radical Hindu groups and incidents of cow protection vigilantes attacking Muslim cattle traders in other parts of India could end up further polarising people in the valley. "The danger," a prominent leader told me, "is that the moderate Kashmiri Muslim is becoming sidelined, and he is being politically radicalised." The security forces differ and say they are actually worried about rising "religious radicalisation" among the youth in the valley. A top army official in Kashmir, Lt-Gen JS Sadhu, told a newspaper that the "public support to terrorists, their glorification and increased radicalisation are issues of concern". One army official told me that religious radicalisation was a "bigger challenge than stone pelting protesters". He said some 3,000 Saudi-inspired Wahhabi sect mosques had sprung up in Kashmir in the past decade. Most Kashmiris say the government should be more worried about "political radicalisation" of the young, and that fears of religious radicalisation were exaggerated and overblown. Also, the low turnout in this month's elections has rattled the region's mainstream parties. "If mainstream politics is delegitimised and people refuse to vote for them, the vacuum will be obviously filled up with a disorganised mob-led constituency," Mr Mattoo of the National Conference said. In his memoirs, Amarjit Singh Daulat, the former chief of India's spy agency RAW wrote that "nothing is constant; least of all Kashmir". But right now, the anomie and anger of the youth, and a worrying people's revolt against Indian rule, appear to be the only constants.